I started by soaking the liver in milk for a few hours. After all of my online research, that seemed to be a common method of preparation. For the onions, I sliced them up and sauteed them in a couple tablespoons of butter. When they became translucent, take them out of the pan and onto a plate. Now for the liver....ewwwww! After soaking, I drained the milk and coated the livers in flour, salt and pepper. Then I put them in the pan the onions were in. I cooked them for a few minutes on each side, until they were browned. Then place on top of the onions. I really wish I could get excited about this, but truth be told, I didn't even try it. The husband said it was good! What about you? Does your family eat liver? How do you prepare it? p.s. Does your recipe include Baking Powder? If so, check out Ott,A's Iron Chef Challenge sponsored by Clabber Girl! no liver for this girl! my mom and dad love it though! I remember my mom and aunt cooking it and how bad it smelled. Never could get past the taste of it! Thankfully, my husband doesn't like it either!! I shared my instructions for bringing a chicken, naturally dyed Easter Eggs and an article. I hope you like them! The liver looks great! Yes, my husband & I both eat liver. We grew up in the Philippines and almost all Filipinos eat liver. It tastes good when grilled, fried or cooked in lemon and soy sauce with lots of onions! But I don't like it when overcooked...it becomes chalky in texture. Liver is a no here. But that was awfully sweet of you to cook it for him. I'm in awe. I won't even touch it at the grocery store! My dad made us eat liver and onions (and a bunch of other not so good things) when we were kids but no, I do not like it. I don't even like onions! You are a great wifey to cook it for him! 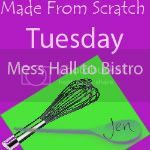 I will have to join the made from scratch Tuesday next week! I grew up with Liver and Onions but I never think to make it. My family wouldn't go for it. I added my Tomato soup recipe today. Thanks for hosting! Found you from RFOA website. I have never had liver and onions...I am a new follower. Liver and onions was one of my dad's specialties growning up and I inheirted his recipe. I melt half a stick of salted butter in a BIG skillet, coat the liver in a flour/salt/pepper mixture, brown on both sides then remove from the pan and lay down a layer of onions, put liver back in and cover with more onions. Fill the skillet almost the top with water and simmer for an hour, until the water is almost all gone. It is so tender and yummy! The "livery" taste so man people hate is taken away and just leaves you with a nice beefy flavor!